Frameless single glazed glass partition system available in either straight lines, faceted or curves. Polar Single Glazed minimalist form is designed with the minimum of components, thus facilitating speed of erection without compromising structural stability and rigidity. The patented bubble joint ensures a virtually frameless system with no vertical posts between modules, corners or three way junctions. 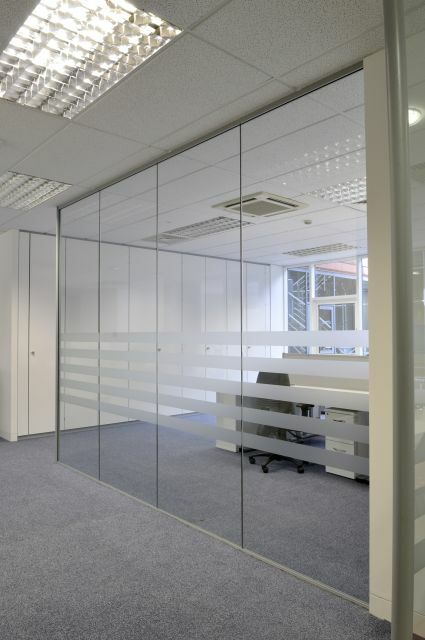 Polar Single Glazed partitioning can be integrated with other Komfort partitioning systems. Doors can be framed, frameless or sliding. Glazed doors can be single or double glazed. Doorframes can be aluminium, timber or MDF veneered. An extensive range of complementary ironmongery is available. Acoustic laminated safety glass, 10.8 mm thick: 29 kg/m². Acoustic laminated safety glass, 12.8 mm thick: 34 kg/m². Toughened safety glass, 10 mm thick: 27 kg/m². Toughened safety glass, 12 mm thick: 32 kg/m². Toughened safety glass, 15 mm thick: 39.5 kg/m². With deflection heads: ≤30.55 kg/m². The product information below is from the NBS Plus library of product clauses offered in NBS specification products. It has been created by NBS for Komfort Partitioning Ltd. Each product clause is authored in NBS format and is intended for inclusion in project specifications. Please note that NBS product guidance is not a replacement for the manufacturer's literature and it is recommended that Komfort Partitioning Ltd be consulted before specifying. For frameless and sliding doors.